More cream than antique white. Screws were a bit difficult. It’s beautiful, but I wouldn’t recommend it to someone that had any difficulty with hand strength. Accentuate your home with a touch of traditional beauty with this Valerie dining table. The elegant piece features four spindled legs and a plank top for a classic appeal. Four different finishes are available, allowing you to select the one that coordinates well with your existing space. Dimensions 63.0 In. X 36.0 In. X 31.0 In. Table arrived and it was packed very nicely - the table is made in Brazil the top is made of pine (seems like) there's some sort of coating on the top that gives it a slight sheen but not shiny, kinda like plastic coating. The planks on the top are made to give it a farm house rustic look- uneven boards with indentations but with a soften finish. The legs are very heavy might be a different wood but they are nicely done - they are more rustic than the table top. If you wipe them with a paper towel pieces of the paper will get snagged. Just wipe them down with a soft cloth and it will be fine. The table had a broken piece on the underside b/c the screws to hold that piece in place were not put in and the wooden dowels that held it snapped during shipping. I was able to fix with wood screws and wood glue - no problem. Other than that I would of given it 5 stars - I didn't bother contacting overstock for a return b/c it was an easy fix. 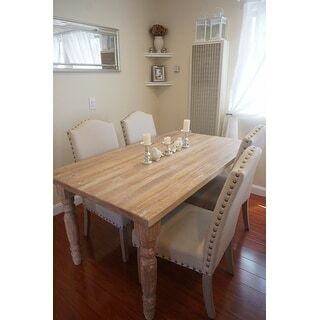 Was worried ordering a table online, but if you are looking for a good deal on a farmhouse table, this is great! Took less than 5 min to put together (with a power drill rather than included tools). Looks great, not plasticy. Table top is rustic and does have bumps, grooves, knots, unevenness, etc which is how it’s supposed to be but if you don’t want that, don’t get it. It is also not shiny but does seems to be finished with a matte finish. I ordered the driftwood color and it’s modern without being too washed out or white, has tans, pine color, a tiny bit of gray so it still looks good if your house has some brown furniture and would go with white/creams as well. I liked it so much I am now ordering one of the benches to go with it. For the price and the look I wanted for my dining room, this table is a great option. It is not "fine quality" but is solid and looks great. I purchased this in the Barnwood finish (dark) and also purchased the matching bench (which is terrific and matches perfectly). The table arrives in a very large box and is packed in styrofoam - so quite messy to open and extract. My box arrived with significant damage and I was a little concerned. The table top was in great condition, however, with the exception of 2 small corner pieces that hold the box underneath the table top that contains the 4 table legs. I'm not sure if these are needed for supporting the table or only to help hold the box that contains the legs in place but they are stapled in and glued but the staples didn't penetrate deep enough and the glue let loose. I re-glued these pieces and stapled them to the table, just in case they were actually helping to hold the tabletop together. One of the legs was dented so I contacted Overstock and they were very helpful and managed to order a single table leg which arrived the other day (but I haven't installed it yet). Initially they wanted to send me a whole other table and just have me extract one of the legs but once I described what that involved (taking apart the whole box and cutting the straps that hold the box underneath the tabletop) they dug deeper until they figured out how to just ship a single leg (all I needed). Prior to assembly, I heeded the advice of another reviewer and purchased better lag bolts for both the table and the bench (1/4" X 4 1/2" for the table and 1/4" X 3 1/2" for the bench) and was glad I did. I also purchased an adapter for my drill so I cold use my ratchet attachment and drill these large screws in -- went quickly and easily! When assembling, I noticed that the rectangular box that holds the table legs onto the table top was slightly skewed so one leg is slightly more forward and the other slightly farther back. When the table is in place, however, this is really not noticeable but is one of the reasons why I gave this table 4 stars instead of 5. I will also have to see how the tabletop wears... It does look lovely, though! I'm still searching for comfortable chairs to go with the table. I would love to get the ones in the photo but unfortunately Overstock doesn't have them and I can't find them anywhere online. If someone has found them, please post on this site with a review and where you found them! Thanks! This table is well made (in Brazil) and very solid. Please note that it is 1 inch higher than is usual for dining tables. This could be a factor is you're planning to use it for a desd of other purposes where ergonomics matter. Assembly takes only 2 screws in each leg. But since you're screwing into very hard wood, it does take some effort. I used by electric screwdriver with hex head bit. I deduct a star becasue my one complaint is that the finish, while making it impervious to most staining, is quite glossy. I have the Barnwood. The picture led me to expect a more matte, natural finish. But, I like the table so much, I decided to keep. And also because it was so heavy, returning it was $*** Once the table is dressed, the gloss is much less noticeable. But I do intend to apply a light sanding to knock down some of the shine. Also, the pics show a grey undertone. The Barnwood does not have that undertone. To me that was actually a positive. As others have stated, it is a very rustic surface with knots and all. The "boards" are not flush but I have not had any problems with glasses tipping or anything like that. Gives it a timeworn look.But there are no splinters or rough edges that might harm little ones. 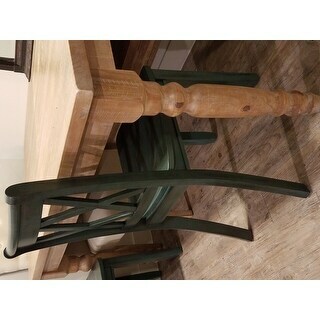 sturdy and high quality pine wood dining table! The price is very good for this amazing table! the color is what i was looking for. I am excited! this table is the perfect size for my kitchen! I love the plank top look and dark barnwood color. assembly was easy and the table is very sturdy. I just wish there were coordinating chairs. I thought long and hard about purchasing this for my dining room. 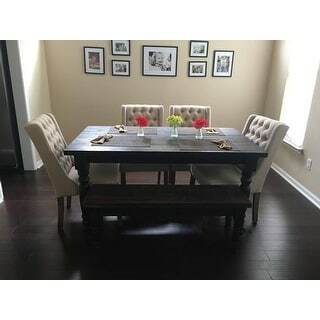 Finally, I ordered the table in Barnwood and it's a dark, espresso color with some light distressing. 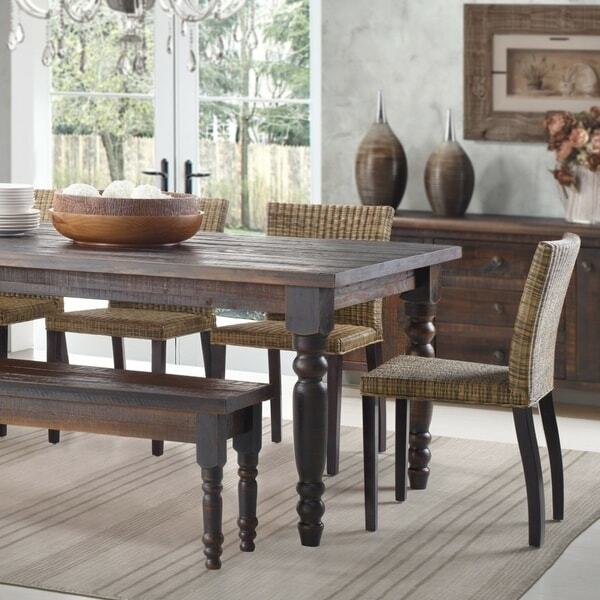 I'm sure the finishes vary greatly on these tables - that's part of the rustic appeal. It's heavy, seats 6 and is a nice looking table. Totally goes with the Farmhouse vibe that's popular right now. I paired mine with cream french chairs with rush seats as I like a mixed, eclectic look. For the price, it's a decent table. Should work just fine for me. 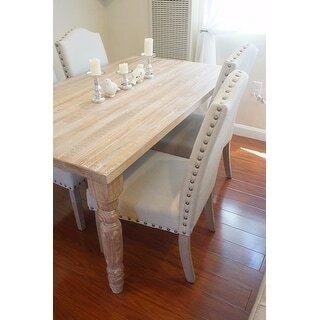 I bought this table with the matching bench and the Evelyn Tufted Wingback Chairs to use in my dining room. The picture did not do this table justice. It is beautiful and gave me the farmhouse look that I wanted without me having to pay the big bucks. I've had it for a year now and it has held up extremely well against my 2 year old and any little guests we have over. Cannot recommend enough. I searched for a long time for the perfect formal dining table, and I definitely made the right choice with this beauty! It's very solid, nice wood with a very pretty finish. I just love it! I bought the lighter color- the top of the one I received has a lot of white in the distressing but I quickly grew to love it. I have 2 kids that do HW, eat, roll cars and everything else on this table and it is standing up to the wear. Paired it with 4 tabouret dark steel chairs and 2 of the Lexi Parisian smoke grey chairs and the whole look really came together. Amazing quality for the price. Easy to assemble. We're a family of 5 and this table will be used for all our meals and homework etc., so I'm having a custom glass ($**) placed on top to preserve wear and tear. Overall, I'm very pleased. Love this table!! Got the driftwood. It's perfect. Perfect size and I love the color. It's light and warm and the driftwood gives it a worn look that is really pretty. Love this table in our kitchen. Spacious and easily seats 6. We also purchased chairs and the country flair is exactly what I was looking for. Great kitchen set. Cleans easily with sop and water. 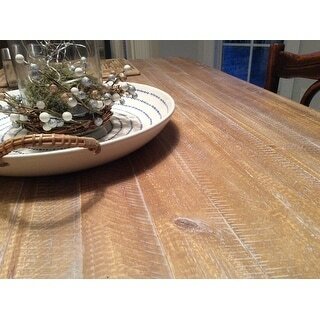 I absolutely love this farmhouse table in my kitchen. I also bought the matching bench and if luck would have it, I already had the 4 wicker chairs shown in the Overstock website photo!. This table is made well, heavy and not too large. Perfect as a kitchen table for 6. I would recommend the table and the bench. Nice, sturdy dining room table. Perfect for the modern farmhouse look. The only part I am not a fan of is the table top, which is not even. It was exactly the color and look we were going for thank you! "Is there a version of this table with a longer length, say 80”L or 96”L? I love it but I need a longer table!" "What is the distance between the inside of the legs length wise? I have a bench I need to fit underneath the table when not using the bench, which is mounted to my wall." "Does this white washed one have a yellow cream tone at all "
"How do I buy one part (i.e., leg)? I need a replacement if possible." We do not carry single parts on Overstock, for this you would need to contact the manufacturer directly. "How much does this table weigh?" This is approximately 102 pounds. "Is this for the Gracewood Hollow brand or the Grain Wood brand Valeria table? 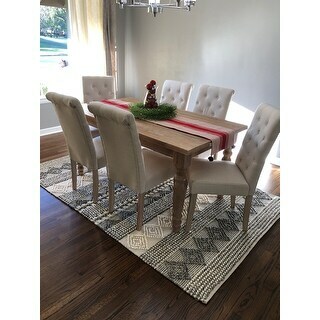 I want to order the Grain Wood brand Valeria table which this looks like but it appears to be labeled under the Gracewood Hollow Deveraux Grain Wood. I canceled my order due to this specific labeling on the product. Please clarify so I can order the correct table. Looks like Overstock has reviews on her for both tables also. I am quite particular so I would like to know what I am ordering prior to ordering it." "Can the table top be stained?" It states in description that it is Pine, Wood so I am guessing it would be okay to stain. However, I don't know why you would want to go through all the work when the table already has a beautiful stained look. I got the dark Barnwood color and have had it about a year now and love it! To my eyes it has a stained appearance-rustic look.